One of the things that I like about Giada’s recipes is that she is serious about the spices and seasonings. I don’t have to add anything; she has it handled. I have had her recipe for lemon-cumin chicken in my database for a while. I tried it on a recent Saturday and it was a success. I prepared the marinade as specified and I let the chicken marinate for close to five hours. I bought the thin-sliced chicken breasts at the full-service meat counter of our local grocery store. I cooked the chicken on our outdoor gas grill. I had never made pesto before. The task seemed daunting. I have watched enough cooking shows that I really should have gotten it that pesto isn’t that hard. But it just never sank in. This recipe called for pesto, however, so I decided to tackle it. It was really very easy and came out quite tasty. I substituted pine nuts for walnuts because that was what I had on hand. Otherwise I followed Giada’s instructions. 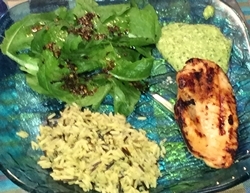 On the side I served Farmhouse Herb and Butter rice mix and I had our home-grown romaine lettuce with my homemade vinaigrette blend. It was a dinner that worked out very well. Pine nuts are actually traditional. Leonard is allergic to them so I use walnuts too.